Climbers are an excellent way to add height to your garden and another layer of interest, especially when space is tight. 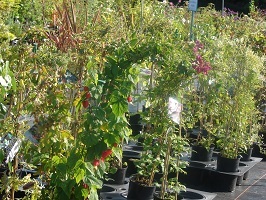 We stock many Clematis with a range of habits, flowering times and colours, including the vigorous, early-flowering montana. 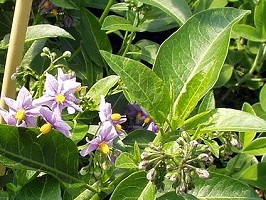 Other climbers include Lonicera (honeysuckle), Solanum (including ‘Glasnevin’ – the Chilean potato tree), jasmine, passion flower, ivy, Abutilon, Wisteria, the evergreen Trachleospermum with its jasmine-scented flowers, Vitis (grape vine), the climbing Hydrangea petiolaris and a choice of climbing and rambling Roses. Click the files to see some of the varieties we have for early spring 2019. If growing climbers up a wall or fence, try to plant them at least a foot away so there is room for the roots to spread and they are away from the ‘rain shadow’. Few climbers are self-clinging so will need support, which can be by attaching horizontal support wires through drilled ‘vine eyes’, through trellis or through netting. They can also be grown up arches, pergolas, obelisks, trees or large shrubs. To get climbers off to the best start, plant in a large hole back-filled with organic matter and a handful of bonemeal. You should also consider giving a prune a couple of feet from ground level to encourage the plant to bush out, depending on type. If planning to grow in containers, the bigger the pot the better - these plants have large root systems! Most climbers will want to be in something at least two foot tall, and make sure you keep up with the feeding and watering. 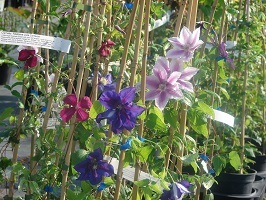 Among Clematis, alpina, macropetala and Raymond Evison varieties are better suited to container growing than some others. 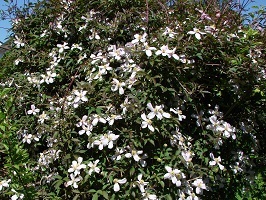 The general rule for pruning Clematis is: if it flowers in spring (such as montana or alpina varieties), there is no need to prune it; if it flowers in summer, give it a light trim in early spring when the leaves first appear; if it is a late-flowerer (such as the daintier viticella and texensis types), cut it to within a foot of ground level in spring. Clematis have a reputation for favouring east-facing walls and fences, but a good number are happy on any aspect - ask to see our Clematis list by the till. For climbers for north-facing walls click here.